These little pies are good, really good. Not like anything I share with is isn’t good but these are dance around the kitchen, marriage proposal inducing, good. I’ve made them twice this summer, and I’m excited to expand into fall apples and pears. 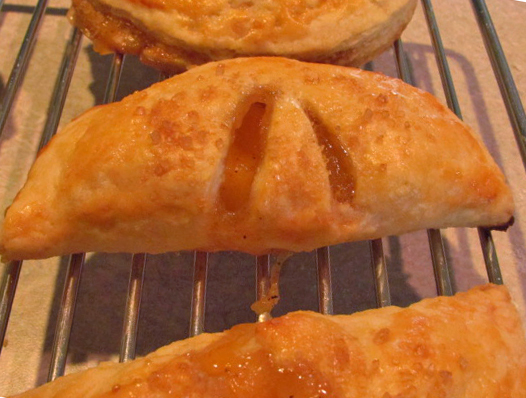 I work up at 6:30 am to make a dozen peach hand pies for a work meeting last week. You could say I love my job, but I really love my coworkers. I think these have the power to make any meeting better, you should give it a try and we’ll test this theory. We all know the best part of pie is the crust, this nice little pocket has twice the crust! Which means that the crust recipe is very important. I use my good ol’ standby from America’s Test Kitchen. If you prefer your own recipe make sure it is a soft one, if it is to dry it will crack and the fillings will spill out. These are simple like pie, versatile like pie, but they are totally the cute little sister that can do no wrong! I’d love to know what new and delicious fillings you try. A double crust pie recipe makes about 24 5-inch pies. The crust can be made a day or two ahead, just be sure to take it out of the fridge about 3o minutes before working with it. Divide dough into two even balls and flatten each into a 4-inch disk. Wrap each in plastic wrap and refrigerate at least 45 minutes. 1 Tablespoon vanilla or half a vanilla bean scraped. To peel the peaches I find it easiest to bring a pot of water to boil, drop the peaches in the water for a minute or so, then quickly remove them to a cold water bath. This allows them to cook just slightly so the skin just slides right off. Combine peaches, sugar, brown sugar, flour, cardamom, nutmeg and vanilla in a large bowl. Toss to mix well. Let stand for about 15 minutes so the juices and flavors blend. 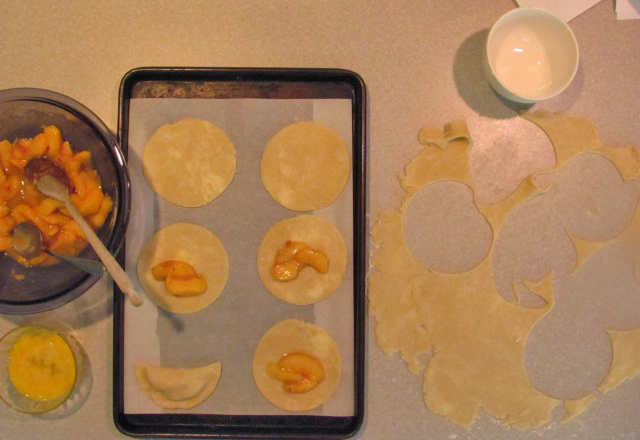 Roll out the crust and using a small cereal bowl or large round cookie cutter cut out small rounds. I used a knife to trace around a 4 1/2 inch cereal bowl. Place 6, or so, crust rounds on a parchment lined baking sheet. Spoon pie filling into the middle of each round. Careful not to load them up because they need to have room to fold in half. 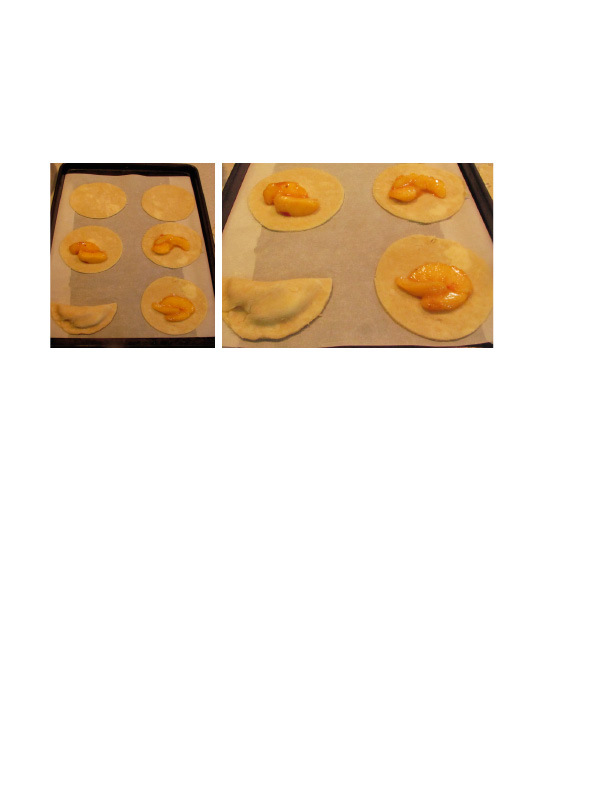 Using your finger, outline the edge of the dough with egg wash, then fold the dough over. Using the tines of a fork press on the edges to seal them. Lightly brush the pie with more egg wash and sprinkle with sanding sugar. Using a sharp knife make to small air vents on the top of the pie. Bake at 400º for 20-30 minutes until the crust is nicely brown and the filling is bubbling. Repeat with the rest of the dough. From one double pie crust I had 24 pies and a little extra filling, but depending on the size of your rounds, etc adjust accordingly. This entry was posted in Dessert, Fruit, Recipe, Summer. Bookmark the permalink. I did the samething with pienapple. I think I should try peach hnd pies like this. They looks so stunning and sounds really yummy! Made these tonight. Delicious! Thanks for the recipe!